This is another Perec-ian exercise. 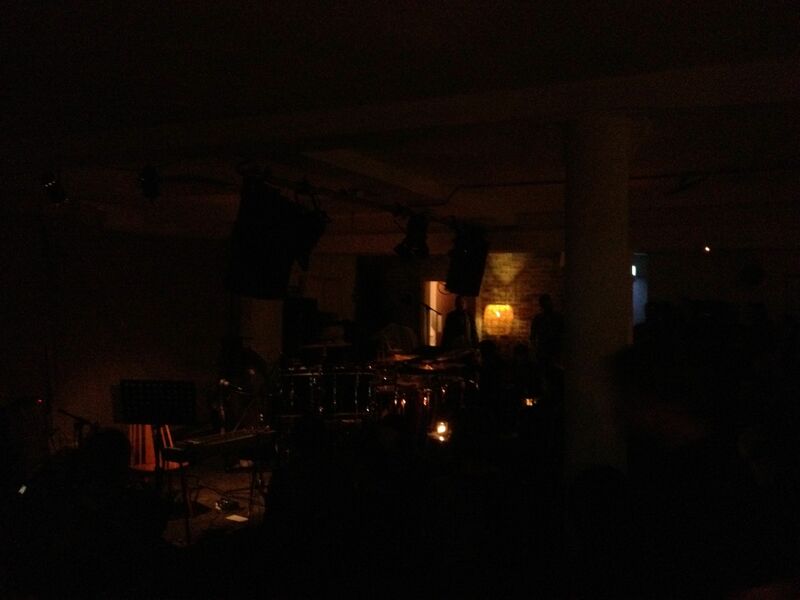 It is not a description of what Café Oto is ‘like’. So no atmosphere or documentation of the music or performances. Just a bare description of the room at a particular moment in time. Maybe it is an exercise to be repeated at some point in the future. Outside. Left to right: 2 big windows, a doorway, another big window. White awnings over the windows. The windows face south. Inside. 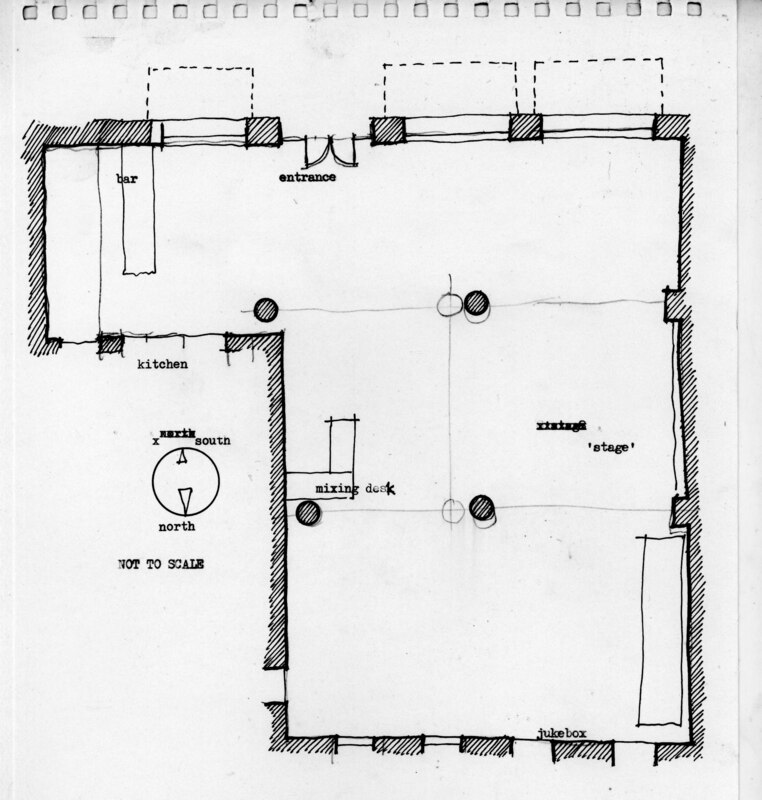 An L-shaped room with the bar in the short leg to the right of the door (east). In the main space, in front and to the left, there are 4 cast iron columns supporting beams running across the short dimension of the room. The floor to ceiling height is about 3 metres. The floor is grey concrete with lots of patches and stains. The walls are mostly white-painted brickwork with a small area where the bricks have been left unpainted. On the adjacent wall to the right is the door to the ‘gent’s’, a fire escape door, the jukebox (turned off in the evenings) and 2 small windows with retractable grills on the outside. Some time ago there was a record shop in the very narrow passage beyond the fire-door. There are also a number of Vent-Axia ventilation grills in this wall. The wall around the door to the gents is unpainted brickwork. On the wall opposite the stage is the door to the ‘ladies’’ and the mixing desk. The furniture is a mixture of second-hand stuff. There are usually about 8-10 tables though when the place is at capacity these are stored. When Oto opened most of the furniture was from the Erco range (there are some photos of the space showing this furniture on the Architects site) but over the years most of these have disappeared to be replaced by a jumble of stacking and folding chairs plus a few benches that look like they might have come from a school. Each table has a night-light candle in a glass. The house lights are very dim consisting of 9 low wattage bare bulbs hanging from the ceiling. There is a single standard lamp with a bulbous wicker shade…this has been around for as long as I can remember though it seldom stays in the same place for long. The ticket desk is to the left of the entrance as visitors come in. There are usually two adjacent tables – one next to the wall for fliers and the other at right angles for CDs and LPs. Next to this there is a rack on which posters are displayed for sale. There are some posters on the wall next to the mixing desk and a few on the glass next to the door. There are plants on the window ledges. When the room is full the windows are covered in condensation. The seating in front of the performance area covers about half of the floor with space for standing at the back. In the bar area there is a blackboard for the drinks prices situated above a window into the kitchen. Behind the bar are the refrigerators for beers and wine with shelves above them. The shelves hold glasses and bottles and display the records put out by the OTORoku label. The bar counter is always littered with plates of snacks and there is usually another box of LPs and a display of the Wire magazine. There is a T-shirt with a picture of Lol Coxhill hanging up on the wall adjacent to the bar.